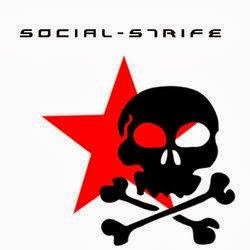 Rock Review Phil: Social Strife "Social Strife"
The EPs opening track, You Were Nothing hits like a ton of bricks with its hard and moderately fast paced punk influenced drum and bass beat. The song is not a punk song, though, as punk songs are generally just power chords and nothing special to listen to from a musical standpoint, and punk songs don’t have choruses as great and melodic as this track. The EP immediately surprises listeners with its second track MDMA, which mixes slow and jumpy verses with faster paced choruses. The song is very upbeat, thanks to Sean Farro’s singing, which is mid-ranged and very raspy, but the melodies that he sings are very upbeat. Terry Doucette’s guitar playing is at its finest on this track, with great guitar riffs and a perfectly simple guitar solo. At many moments, the song reminds me of a hard rock song from the early 80s, specifically hair metal bands like Mötley Crüe, before it was all make-up and glitter and pop. The EP gets back to rocking with Reign and the self titled track Social Strife. Reign is pretty much a heavy metal, practically thrash metal track in terms of its verses, with some intense drum work by Mike Conroy. Social Strife (the song) is similar to the opening track, with a two-chord main riff and very punk-like rhythm section playing. I’m immediately reminded of Canadian punk legends Teenage Head, especially with the songs guitar solo which is played in a very (Teenage Head guitarist) Gordon Lewis fashion. The EP saves the slowest song Aliens & Freaks for last, which is something I dislike when bands do because I always believe listeners should be left with a solid punch to the ears when it comes to hard rock EPs/LPs such as this. It is understood, though, why this was chosen to close the album. It is a very dramatic track, with (likely synthesized) string sections heard and the consistent sound of a acoustic guitar riff heard under the louder instruments. Frankly, this is one well written song and it surprises me every time I listen to it when comparing it to the rest of the EP. As I mentioned already, an EP as good as this deserved a much better introduction than the one I gave, it’s just unfortunate that after I just ran dry for this one, because not one of the five tracks on Social Strife’s self-titled EP fails to impress me. All five songs are very different from one another, which I’m pleased to say I’m finding more bands are getting better at doing lately. There are moments on this EP, particularly the track MDMA that I don’t think many other bands could have pulled off, nor would have even bothered attempting. I’m not certain on the originality of the band, but it is certain that there are not many other artists out there right now who can do what Social Strife have done on this EP. “You Were Nothing” –­ Though MDMA is my favourite track, I don’t believe it captures what the band is all about. The highlight of this EP has to be a heavy track, preferably one of the two tracks that feature some punk influence for two reasons: listeners to get a good idea of the band’s sound and to make people want to hear more, and that’s what I feel You Were Nothing is capable of doing for the hard-rock lover. The song is on YouTube, but Blogger won't let me upload it here (I really hate Blogger sometimes) so you can view/listen to the song here.